Marcel Duchamp, (1887-1968). Chessplayer and Artist. Some months back Chris McKay. 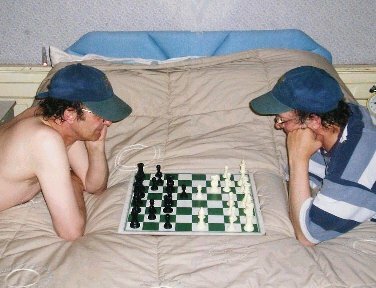 Chessplayer and Photographer. playing chess with a naked model in the Pasedena Art Museum in 1963. "Thought you might be able to make something out that." asked Chris. I said I would but forget all it till Chris e-mailed again. "When?" was all he sent. taken by Julian Wasser of Duchamp and Eve Babitz playing chess. them then surf for yourself. Or better still, go to an art gallery. gave up painting for Chess. Why not do both? So I searched for some games played by Duchamp. I stumbled upon a site that offered me 9 games if I paid a fee. A fee? Me? For 9 games. Are they works of art? 300 sqidzillion games. I found I had 90 Duchamp games. Huh! H.Mueller - M.Duchamp, The Hague Olympiad, 1928. Duchamp played for France so he must have been an OK player. colourful characters in the same team. opening trap completely missing 9. Nxc6. G.Koltanowski - M.Duchamp, Paris, 1929. Here Marcel beats George Koltanowski in 15 moves. one of Koltanoski's famous blindfold exhibitions. No, it was actually from a normal tournament game. I also found a Marshall game I had never played over before. F.Marshall - M.Duchamp, Hamburg Olympiad, 1930. First we have Duchamp bottling it against a much stronger opponent. good player in 1930, he passed away 14 years later. Black to play - I cannot see why he cannot grab the a-pawn. There are no Marshall type tricks on. Black headed for the hills with 20 Qxc2. Maybe being a pawn up was not surreal enough. move that also sets a typical Marshall trap. the detriment of his position. (He's my hero). Here 30 f5 is screaming out to be played. The Knight on f8 is in trouble. 30 f5 exf5 31 Nxf5+ Ke6 32 Nxg7+ Ke7 33 Re8+ wins. 30 f5 Nh7 31 h4 and Black is toiling. 30 f5 Nd7 31 Nc6 checkmate! Marshall played 30 Ra8. I still cannot believe his missed 30 f5. Marshall with this neat drawing combination. back the exchange and go into a dead draw ending. So decided to do a piece of chess art myself. 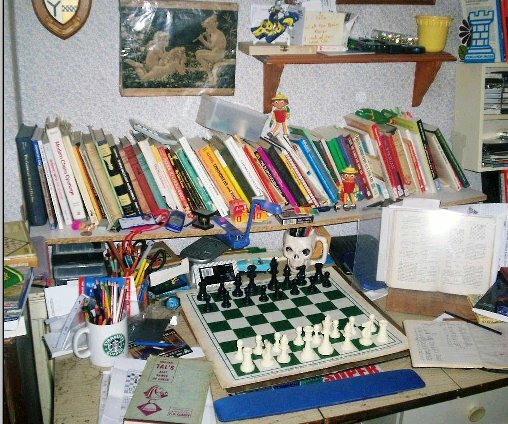 Here is a study in chess. It is where I spend a large part of my sorry, sick and sad life. Looking at the picture, I've never noticed Bill & Ben before. Perhaps that's where the voices are coming from. 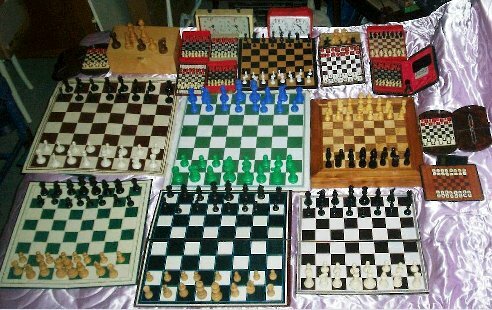 with some (yes some) of the chess sets I have. See the set in the centre of the front row? That was my first chess set. Christmas 1963. I got some of them from car boot sales. Looking at all these chess sets I'm thinking I may have a problem. 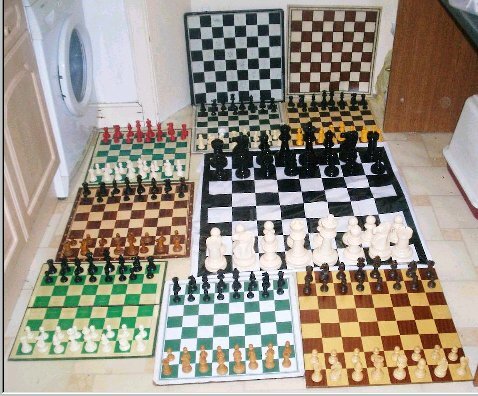 I have a compulsion to buy a 2nd hand Chess set every time I see one. for no more than a couple of quid. the pieces know what it feels like to be part of a masterpiece. I set up the pieces and play over Morphy's famous game at the Opera. on them. Then I put them away. I must seek help. I had just acquired 2nd hand and he thought I was a nutter. I confessed how I brought the price down, now he thinks I'm a rat. I go into a 2nd shop and see a chess set. I pick it up and ask the price. I then check the pieces. "There is a piece missing." I lie. They always knock something off the price. It works all the time. the set a good home. Everybody is happy. He explained the money raised is for a charity. unless I brought the price down. 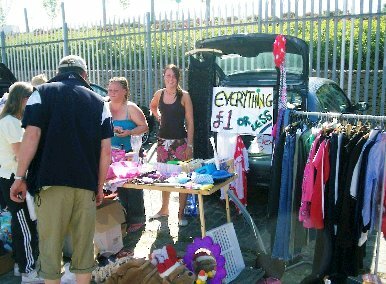 white lie when you haggle. It's part of the fun. Duchamp's playing chess with a naked lady. appearing naked, playing chess, on the World Wide Web. I declined. However, you cannot put a good Chandler idea down.